Let us craft an environment as unique as you are! Whether you are starting a new project or re-modeling, Rino’s Tile & Stone is the place for you. There’s nothing worse than having your project delayed. The team at Rino’s Tile & Stone strives to complete your project on-time and within budget. If quality, reliability and efficiency is important to you, contact Rino’s Tile & Stone for quality counter top custom fabrication and installation. At Rino’s Tile & Stone we believe that the right tile and stonework can shape the look and feel of any space. As an established contractor, our goal is to consistently offer our customers the highest quality of material, workmanship and impeccable service. Whether you are starting a new project or re-modeling, Rino’s Tile & Stone is the place for you! Browse our comprehensive collection of natural stone, ceramic & porcelain tiles ,drop in to our showroom, or call us in Anchorage and begin your journey to for a new bathroom or kitchen today. 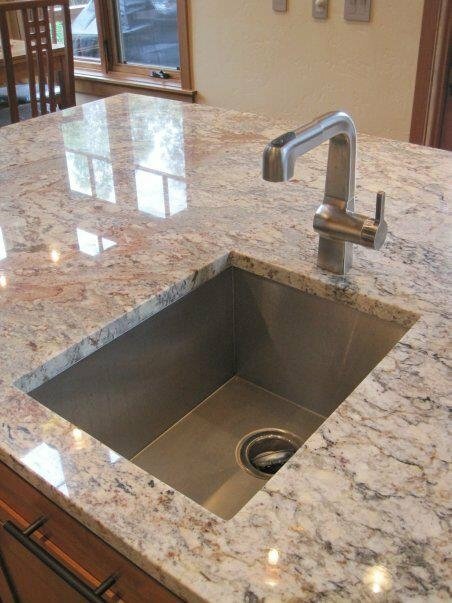 Our selection includes slab granite, marble, slate, travertine, limestone and many brands of Quartz Surfacing. We are licensed fabricators & installers of PentalQuartz, CaesarStone, Zodiaq, Silestone, as well as other Quartz Surface brands. Rino’s Tile & Stone is the only Alaska distributor for Sonoma Tilemakers and Landmark MetalCoat. We also carry many other stone and porcelain tiles. Rino’s Team: Rino’s Tile & Stone has been a local family owned and operated small business in Anchorage, Alaska since 2003. Owner: Ryan, a local Anchorage resident who has been in the tile & stone business for over 15 years. He is hands on during every aspect of fabrication and installation from the initial templating to cleaning up the last seam. He opened Rino’s Tile & Stone as a custom countertop fabrication shop in May of 2003. Computer Specialist: James has been a part of the Rino’s family since 2008. Born and raised in Montana, he has lived in Anchorage for 13 years with his wife and recent addition of a son. He is our resident shop computer expert with extensive experience in CAD programming. Showroom & Sales Manager: Jolene has lived in Anchorage for over 30 years. ACKD accredited through the National Kitchen & Bath Association, and trained in interior design courses. Jolene has been instrumental in many remodels over the past 40 years. Office Manager, Sales Support: Martha, a close friend of the family, is the newest member of the Rino’s team and brings her experience in stone sales and bookkeeping to the mix.